For rural uplift of farming and farmers, it is necessary to recognise certain problems and find solutions for the same. Ensuring (i) remunerative cropping to land-holding farmers (ii) good livelihood to landless agricultural labourers and (iii) freedom from hunger and malnutrition should be high on the agenda. Other aspects that call for action related to policy and planning include mitigation of sufferings caused by (i) rainfall vagaries to dry land farmers (ii) weather vagaries for those with irrigated holdings and provision of relief from unseasonal, non-predictable and harmful weather phenomena like hail to cultivators of annual horticultural as well as perennial, horticultural and plantation crops. Besides the Central government, these plans and policies must evolve from and fully involve the state governments. In view of the above, here are a few factors that I think need to be immediately emphasised upon if we need to save our farmers. For any given crop, cost of production varies regionally in a given season and seasonally in a given region. Thus, MSPs should be computed on a crop-wise, region-wise and season-wise basis and enhanced MSPs as per formulation of National Commission on Farmers (NCF), must be announced way ahead of the start of the cropping season and made known to farmers. But that is not enough. The cost of electricity and water for irrigation varies amongst states. While a farmer is charged generally on the basis of area irrigated, some states levy charges for quantum of water supplied with a seasonal weightage. While some states give electricity free to farmers, others do so at subsidised rates. These variations must be taken into account in fixing MSPs. Increase in difference of yields at fields and nearby research stations with increasing rainfall is a disturbing sign of lacuna in transfer of technology from lab to land. The unawareness of farmers about the existence and/or quantum of MSPs is a woeful deficiency in agricultural extension. 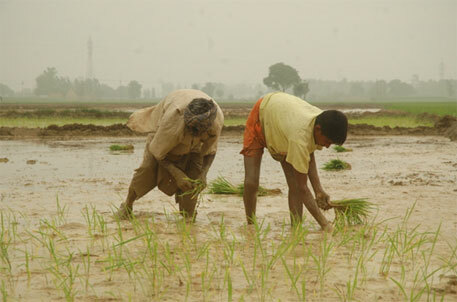 For real-time usage and weather management of crops, it is necessary to appoint climate managers at village level and train them in the concept, modalities, interpretation and use of agrometeorological advisories issued on the basis of state and stage of standing crops and medium-range weather forecasts. In India, no industry has been subject to as many restrictions, controls and blatant discrimination as agriculture. Land ceilings applicable to holdings of food crops but not agro-industrial crops, restrictions in movement and sale of agricultural produce, compulsory procurement of specific quantum of produce by levy by governments are a few examples. We should treat agriculture as a specialised industry and remove all restrictions, controls and compulsions to ensure swaraj for kisans. The above-mentioned measures will take care of the concerns of land-owning farmers. But the problems of a secure livelihood for the unorganised, landless agricultural labourers, who constitute the poorest of the poor need to be taken care of through provision of meaningful and remunerative non-farm employment. To avoid labour shortage in the crop season, such employment schemes should be carried out in off season, preferably as a food-for-works programme in which 30 per cent of the wages are given out as staple food grains at 50 per cent of the cost, at which the same are supplied to non-farming BPL families. Such programmes must lead to creation of durable assets that will assist in production, preservation, storage movement and value-addition to crop produce such as construction of on-farm reservoirs for collection and re-use of surface runoff from rains for alleviation of crop droughts, weather-proof threshing floors, storage godowns and connecting roads. To ensure durability of created assets, farm labourers need to be offered paid trainings. Social and agro forestry offers good scope for gainful year-round employment to agricultural labourers. Last but not the least, all such programmes must be subject to strict performance-audit in place of the current fiscal-audit. Cooperative farming will minimise weather-induced crop losses to a great extent, especially the rain-fed ones. Amid the present conditions of global warming, it is likely that crop losses due to weather vagaries affecting large number of farmers, with both dryland and irrigated holdings, are likely to increase. As risks are covered by insurance, the concept of crop insurance is relevant. In crop insurance, greater the variation in crop production, higher has to be the crop insurance premium. For farmers growing crops low in yield, value and stability of production, high crop insurance premium will not be affordable. The governments, therefore, have to pay in full the entire crop-insurance premium in case of farmers with dryland holdings and farmers with marginal irrigated holdings, subsidise payment of crop insurance premium for farming-cooperatives and other farmers and encourage horticultural farmers and orchard and plantation owners to opt for crop insurance. Food security cannot mean only freedom from hunger. Along with staple foods, protective foods, which, at present, are mostly the various forms of pulses, must also be supplied. Currently market prices of pulses range from 40 to 80 times the Public Distribution System (PDS) prices of wheat and rice respectively. This is a situation that defies all logic. Even middle class families find it difficult to cope with problems like malnutrition, which has become a social problem that can no longer be ignored. To start with, under the food-for-works programme, 30 per cent of the wages should be given out at rates that commensurate with relative costs of production of various pulses and grain crops vis-a-vis PDS prices of rice and wheat.